I get a lot of hits on this post! Would love to hear your thoughts in the comments, if you've tried this recipe! 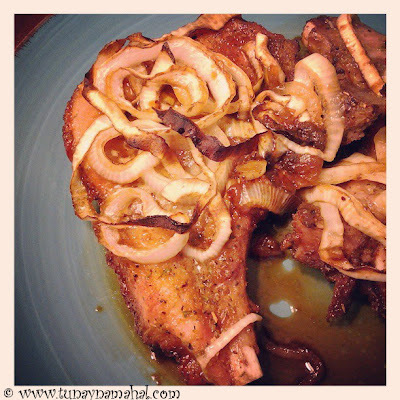 These are the most amazing pork chops ever! I've made bone in pork chops using this recipe (my own) three times already... and they are out of this world. Every time we have them, I feel like I'm eating restaurant pork chops or something. They are that good! I wanted to share my simple recipe with everyone. *Optional: 1 can of mushrooms (or a package of fresh sliced mushrooms). Note: Don't try this with boneless, it tastes completely different. You need the dark meat bone-in chops. 1. Coat each side of the pork chops with brown sugar, McCormick Montreal Chicken Seasoning and Goya Adobo all purpose seasoning. (I don't really measure, I just shake the seasonings on each side of the pork chop until coated). 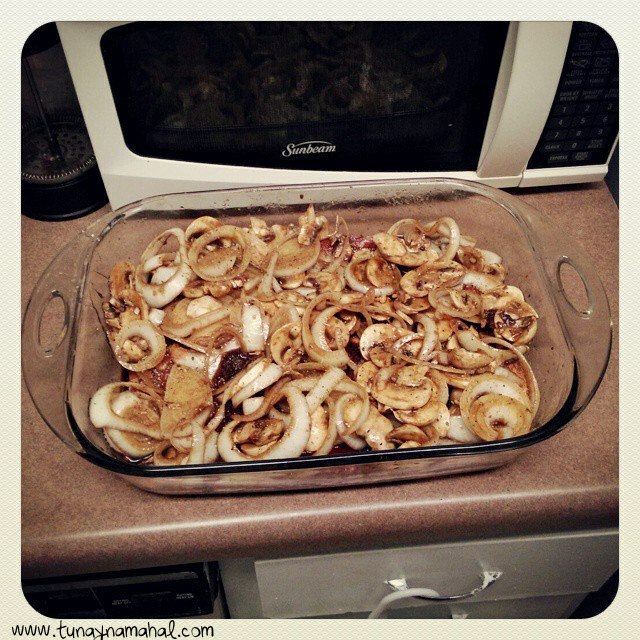 Line pork chops in a large casserole dish or pan. 2. Slice a large onion, toss in a bowl with a little soy sauce. (Just to coat). Pour onions on top of the pork chops. 3. Cook on 400F for about 40-45 minutes. I usually serve these along with some white rice. They are amazing! Enjoy!